and days of wine & roses; shamelessly strident, stentorian and more than a little sentimental. 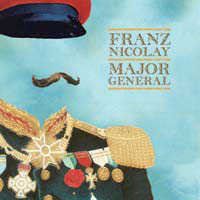 “Major General” is rich with tales of punk-rock disillusionment, redemption, nostalgic regret, ruthless self-interrogations & reinvention, and defiant yet affectionate apologies. It’s a new look for the stylishly vaudevillian jack-of-all-trades with the Jimmy Durante and death’s-head-accordion tattoos. A new stop on a hobo’s-trail of intelligent, incisive hedonism that’s taken him through anarcho-circus punk, Balkan-gypsy, new chamber music, and anthemic classic rock. LIGHT BLUE VINYL.